Usually when I travel I spend hours, maybe days researching each destination, agonising over train times, printing out information and making internet bookings. This time I have to admit that I have made almost no preparations. I am just going to sit back and let the Magical Mystery Tour of Sri Lanka happen !! We arrived tired but safe at the Galle Face Hotel in Colombo at 2:00am local time this morning. Some of the group had been travelling for 24 hours and their body clocks were convinced it was really 6:30am, so they were truly tired. But after a few hours sleep, intrepid travellers that we are, we battled our way through an early buffet breakfast and then headed out on a tour of Colombo’s highlights, Hindu temples and colonial buildings. Not on the itinerary was an “emergency” stop at a private home, where a gracious elderly lady friend of our driver allowed eight total strangers to troop into her immaculately clean house and use her toilet. Iced coffee was served, we chatted about her family living in Australia, and then we all trooped out of her house again. One of those “it would never happen in Australia” moments. We finished the morning with a $3.00 food hall lunch of vegetarian curries – including green mango, jack-fruit, okra and loofah. “Like the one you use on your back only softer” … according to the stallholder. 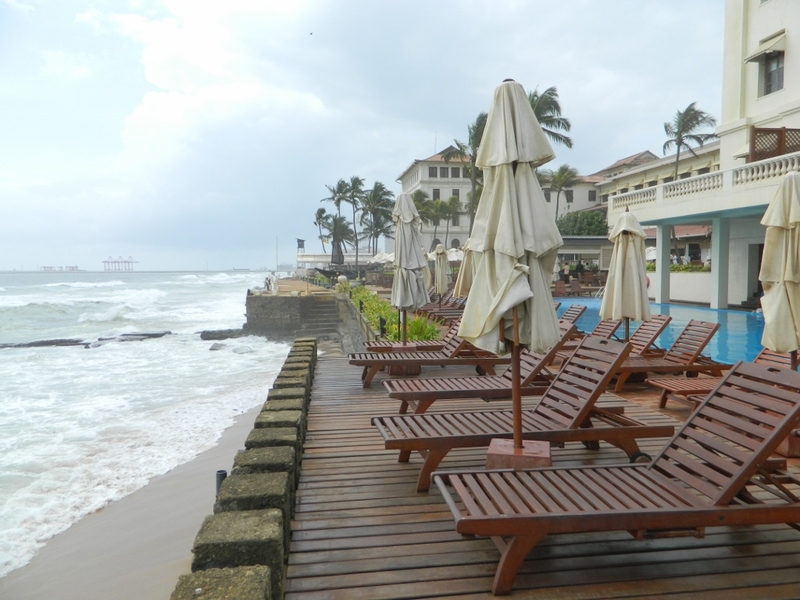 Weather report: warm and steamy with occasional showers but not uncomfortable, especially at the hotel, which sits right on the beach and is today being buffeted by gusts of monsoonal wind. Tomorrow, an early start as we head out to the countryside and the home and garden of legendary Sri Lankan architect Geoffrey Bawa.